TNA Knockouts Champion Rosemary makes her way to the ring. In a darkened arena, Rosemary cuts a promo about what she has done to The Knockouts division. She says that darkness has fallen on it and that The Decay has spread like a virus. Former Knockouts Champion Jade comes out to accept Rosemary’s invite. Rosemary ends up challenging Jade to a Monsters Ball match next week. Jade accepts the challenge and promises to get as sick and twisted as Rosemary is. Both women end up fighting when Rosemary attempts to attack Jade from behind. Jade goes for a package piledriver and Rosemary escapes from the ring. Back from the break, Jade is still in control. She hits a flying head scissors on Rosemary. She then goes back to kicking Rosemary repeatedly. Jade charges at Rosemary in the corner. Rosemary pretends to spew mist at her. Jade ducks and Rosemary hits with her a high knee. Rosemary then mounts Jade and grounds, and pounds her. Shen then connects with a lariat on Jade. Rosemary then tries to ram Jade’s head into the steel cage, but Jade battles back briefly before getting hit with another lariat by Rosemary. She then grabs Jade’s head and rakes her face against the steel cage. Rosemary continues to beat down Jade and even licks her. Jade attempts to rally, goes back to her kicks but Rosemary counters and suplexes her into the cage. Rosemary then grabs the trash can and sets it next to Jade’s head in the corner. Rosemary heads to the top rope. Jade recovers and meets her up there. Jade ends up hitting a hurricanrana on Rosemary. She starts building up some momentum. Picks up Rosemary in a choke hold, rams her against the cage and then slams her down. Covers her for a 2 count. Rosemary and Jade are back on their feet. Rosemary counters Jade and hits a german suplex. They both end up climbing the cage together. Jade knocks Rosemary down. Then she heads to the top of the cage. Jade hits a flying cross body on Rosemary off the top of the steel cage. Jade covers Rosemary but she kicks out. Jade attempts to finish off Rosemary. She goes to the top rope to attempt a 450 splash. Rosemary rises and spews mist into Jade’s eyes. Rosemary then hits the “Red Wedding” on Jade and pins her. Jade is backstage cutting a promo for Impact. She is interrupted by Abyss and Crazy Steve. They tell her that Rosemary will decay her. Jade asks where Rosemary is. The Decay tells her to go find Rosemary and motion to the top of the arena.. Back from the break. Jade is heading up the stairs to the rafters of The Impact Zone. Jade is calling out for Rosemary as she heads to the top of the stairs. Jade is now approaching Rosemary at the top of The Impact Zone. Rosemary is laughing at Jade. She calls Jade, Gail Kim’s chosen one. Rosemary starts going into a rant. Jade tells her that she doesn’t know or care what Rosemary is saying. She tells her that they will be facing each other for the vacated Knockouts Title. Rosemary tells Jade that she is darkness and chaos. Jade says that she is not scared of her. Rosemary points to the Six Sided ring below and suggests that they meet in a steel cage. All Gail ever hope for was to be the Knockouts Champion and hopefully inspire someone. Gail calls out Jade. It’s no secret that Gail feels that Jade is a important part to the future success of the Knockout’s Division. Gail sees alot of herself in Jade. The drive, the passion, the will to succeed. Gail believes in Jade. Gail says that Jade has everything it takes to be successful in this company. 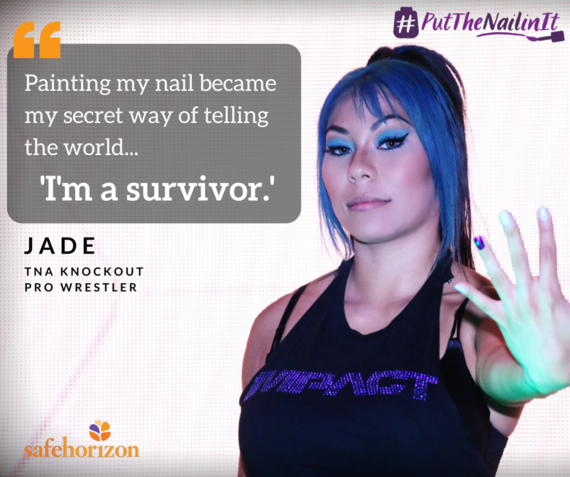 Not only is Jade the future of the Knockout’s Division, but the future of Women’s Wrestling. It’s really important for Jade to be out here because Gail has been waiting for the right opportunity to make an announcement. Rosemary comes down to the ring with The Decay. Rosemary spits mist into Gail’s eyes. Rosemary drops Jade with a F5. Abyss chokes JB. Rosemary gets Gail in a guillotine choke. Crazy Steve keeps Jade away from Rosemary. Rosemary goes to the ground and pound attack on Jade. Abyss puts a garbage can afront of Jades face. Rosemary connects with the Coast to Coast. Jade and Grado defeated Sienna and Drake after Jade hit Sienna with a Package Piledriver for the win.